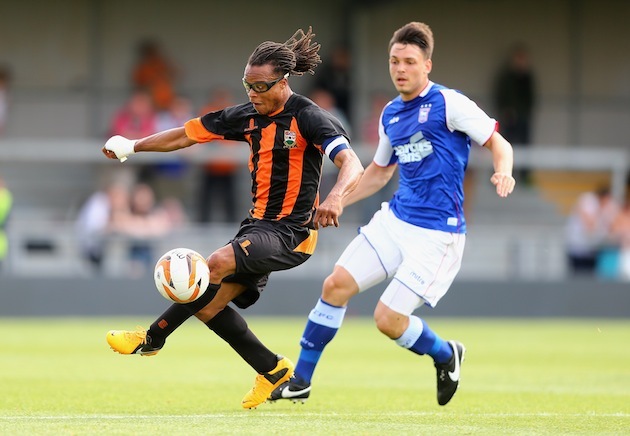 Barnet player-manager-captain-emergency supporter transportation organizer Edgar Davids has decided to forsake traditional shirt numbering to make sure everyone is clear on his status at the club relegated from League Two last season. The 40-year-old midfielder who won the Champions League with Ajax and three Serie A titles with Juventus told goalkeeper Graham Stack that he will be taking the the No. 1 shirt this season — a move that he hopes to turn into a new trend. Presumably among player-managers in need of a numerical reminder that they are the boss. After wearing No1 during Barnet's 4-1 friendly defeat to MK Dons on Saturday, Davids told Barnet's Times newspaper he had made the shirt his own. "That is my number for the season. I am going to start this trend." Barnet's goalkeeper Graham Stack, who will wear No29, told the paper: "Squad numbers mean nothing to me and I've had a few over the years. So it is not an issue for me. Edgar Davids has asked to wear number one, he asked me what number I want and I said I didn't mind." Of course, after asking Stack to give up the No. 1, Edgar Davids had to get approval from Edgar Davids to make the change. But Davids was on the same page as Davids, so it wasn't a problem. Next on Edgar Davids agenda: Getting league approval to wear captain's armbands on both his arms and his legs all at the same time. UPDATE: As DT reader @pkelamis points out, former Greece international Pantelis Kafes (among others) beat Davids to this idea when he played in midfield for AEK Athens.